Hi there! Today I have a layout to share that is somewhat a Part II of my 'Angel of Light' canvas. Both were inspired by my recent life struggles and my journey to overcome the worst. My goal for this layout was to create something edgy but with a soft side... kinda like my personality at the moment LOL. So I decided to go with papers from 7 Dots Studios' Nature Walk collection and Maja Design's Vintage Summer Basics and Vintage Autumn Basics. All of these collections are older lines. I've been on a mission to use up all of the patterned paper that I own and, at the moment, this works well for me because I tend to be choosing papers based on my theme and colors instead of printed designs. My style of crafting includes a love for depth and dimension. This is why you will normally see a lot of layers on my layouts. Beneath the photos I added layers of torn, crumpled paper scraps that were leftover. Beneath the paper scraps I layered two chipboard designs by The Dusty Attic - DA1185 String Frames Small and DA0737 Cyclone Wire. The little flower blooms were handmade using Donna Salazar's Bitty Blossom dies and the metal gears are made by Advantus. Here I added a little stitching around the quote strips for added texture. The larger flower was cut from Donna Salazar's Rose Creations dies. I love making my own flowers because they are guaranteed to match my layout when cut from coordinating papers. The chipboard flourish is DA0628 Corner Flourish #1, and the black border was punched from scrap paper using Fiskars' Threading Water Border Punch. I set eyelets into each hole because I felt it added to the grungy/edgy theme. Hope you like my layout. I really enjoyed making this one! You can purchase Dusty Attic chipboard HERE, and if the design you are looking for happens to be out of stock, you can place a special order HERE. Natasha, love love this layout. Your story behind the layout takes me back and forth between the written and the photo's. 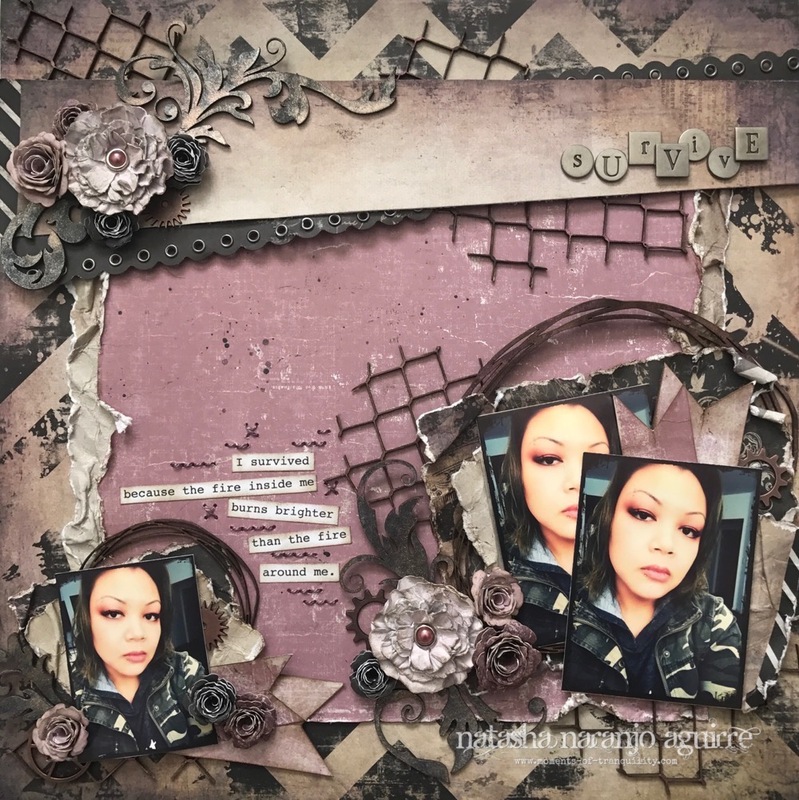 Love hearing how you use what you have in your stash to great layers and texture to your work.... thanks for sharing. Gorgeous the color combo and layout. So glad you're creating again.